Welcome to my porch. We have a few hours before the sun gets too hot to sit out here. The porch is shaded in the morning and is nice if there is a breeze. Last night I watched a Netflix movie made for television about Florence Nightengale. She was one of my heroines while I was growing up. I admired her and Clara Barton and Dorothea Dix…all women with strong convictions to help others. During the many times I was ill as a child I read and reread stories about those women and the Cherry Ames series about the adventures of a nurse. There were twenty seven titles in all, and I think at one time or another I read almost all of them. I was going to be a nurse. 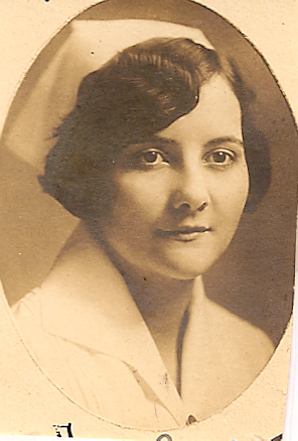 The only picture I had of my mother was one of her in her nurse’s uniform when she graduated from the school of nursing. In a way I guess I idealized her. I pictured her as the perfect nurse. I wanted to be just like her. 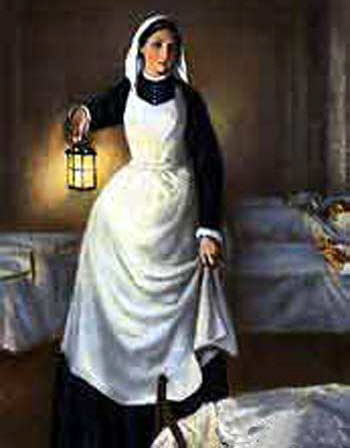 I would stare at her picture for hours and see myself in the nurse’s cap and uniform. I was going to be the second Florence Nightengale. When I was growing up in the 50s, it was still a time of limited careers for women. A young girl was encouraged first to find a husband and raise a family. “Go to college to get you an MRS. degree,” was said with a snicker. Until that happened she was encouraged to be a nurse, a teacher, a secretary, a sales clerk or a telephone operator. I would play “hospital” with my dolls. My aunt would keep a supply of old sheets in the linen closet to be used for bandages. I’d get in there and tear the sheets into strips and almost mummify my poor sick babies. Whenever we played in the neighborhood, I was the one who took the kids with banged up knees upstairs to tend to their wounds. When I was thirteen I volunteered at a nearby hospital every day during the summer all day long. I was in the first class of teenage volunteers. There weren’t a great deal of guidelines as to what we could and couldn’t do, so we found ourselves doing many more things than are presently allowed. I was even allowed in the surgery suites to observe surgery. I did that for two more years. My senior year the counselor recommended me for an Army scholarship. It would have paid for all college classes and nursing training in exchange for military service. I figured my suicide attempt might figure in so I wrote a letter explaining about my father, and I was fine, etc. in case the topic came up. I took the train to Chicago along with girls from other high schools for an interview and a physical. I checked “yes” on the questionaire about my suicide attempt which I now considered ancient history of four months before and attached my letter. When I went in for the interview, I saw my letter in the waste basket. I fished it out and gave it to the interviewer in the next room. Of course I wasn’t accepted. That and my by now less frequent asthma problems kept me out. God was watching over me. Had I been accepted to that program, I would have found myself in Viet Nam before my enlistment was up! I admire those nurses greatly. I just know I could never have kept up with them. I was so singularly focused on being “THE nurse” that no other choice was ever considered. Instead of going to the same nursing school as my mother, I chose to go to college. First semester was basic core subjects. Second semester we added introduction to nursing. It was then that I found out that the hospital where we would be training was over an hour’s ride away. In order to be there by 7:00, the student nurses had to be on the bus by 5:30 A.M!!! If you think they could go back to sleep, you are wrong. They had their classes on the bus. I don’t THINK so! That’s one of the things they don’t tell you when you sign up for class. I can’t even remember much of those hospital days. As a freshman, it was only once per week but that was too much for me. The cold bone chilling winds across the Illinois farmlands and the lack of ability to think at that time of morning was too much for me. I started looking around for another school. I visited a friend one weekend and was going through her college catalog. I came upon the nursing education section. “That’s it! I’m transferring.” I wrote to them and was told I would be accepted if I took organic chemistry and biology during summer school. All was settled. By this time I was making all decisions for myself. I was on a scholarship that paid for everything so my father had no say in what I did. I entered the nursing program in Chicago. It was summer in Chicago. Hot time. Summer in the city. I was staying at the un air-conditioned YMCA hotel downtown. There were loads of kids my age attending various schools. I didn’t pay much attention to organic chemistry. It was way over my head. Biology was OK. I didn’t know anyone to ask for help. I guess I really wasn’t much interested in help. I mean, I was staying at the Y M C A for gosh sakes! It was 1965. The 60s were just getting started. Who had time for school?